There used to be a time when lip balms were made in the home kitchen (or in granny's kitchen) with crushed sugar, honey, lemon and rose petals, or with milk cream and rose petals — a Cleopatra favorite. Since then times have changed, lives have gotten busier, Cleopatra is long dead and grandmothers have become "smart elders” wielding smartphones. Who has the time or patience anymore? Enter the ubiquitous lip balm... found just about at any store that sells everything from hardware to poultry. Lip balm is a staple product that can be found in every woman’s handbag (these days, some men carry it too!). A good quality lip balm makes your lips look healthy and keeps them soft. If you are facing dry or chapped lips, applying a thin coating of lip balm usually softens them up, and in most cases, your lips will start feeling a lot better immediately. This is because a lip balm helps heal lips faster and keeps them hydrated, or at least keeps moisture from escaping any further. Your lips are one of the most noticeable features of your face, but they are often ignored, when compared with your other facial features. Well-moisturized lips look and feel soft, are attractive and no doubt, feel great. There are several ways to keep your lips soft and moisturized such as eating a balanced diet, avoiding harmful chemicals and harsh sunlight, but the simplest way to protect your lips would be using a good lip balm. Lip balms are a product you can find virtually anywhere these days — grocery shops, gas stations, coffee shops and even bookstores! You can find them on the shelf next to chocolates, mints and candy next to the pay counter, what is commonly called as the “impulse buy” section. Unlike lipstick, which is used more often and frequently, lip balm is often just taken for granted. ​While the rest of the face contains a natural barrier to preserve moisture and defend itself, lips contain almost no natural protection from elements such as the sun, dry air, and the wind. In order to keep lips plump and supple, it is essential to apply the best lip balm to increase hydration. Before we start looking at what are the best products in the market for you, let’s take a look at why would you need a lip balm. Are your lips cracked because of the winter chill? Or are you just afraid the unrelenting heat would damage your lips? Or you just have naturally dry lips and you are looking for a lip “medicine” that you can use on a day-to-day basis? In all three cases, there are a plethora of products that you would like to use. Lips balms differ from lipsticks or lip gloss because of its slightly waxy and oily texture and its soothing qualities. They are made with any number of ingredients such as beeswax, shea butter, camphor, paraffin or lanolin. Sometimes, they may also contain flavoring or essential oils, sunscreen and in some cases, medicines for various treatments such as cold sores. Since lips are quite thin, lip balms are designed to add an extra layer to them since they have the ability to seal any cracks you may have on the lips and keep them safe from outside elements. Let’s take a look at the several factors that you should look for before you choose the right type of lip balm for yourself. As we mentioned earlier, lip balms consist of several ingredients that may or may not suit your skin type. This ultimate handbag essential is probably a beauty product that is applied directly to your lips and is likely to be ingested almost immediately after its application. So choose wisely and choose something that you wouldn’t mind eating! One has to be careful about applying it too; overapplication can lead to the exact opposite results you are looking for. You should be wary of lip balms containing petroleum products such as petrolatum that have a tendency to sensitize the skin and has been flagged for some common health concerns. Shea butter has many medicinal properties and contains vitamins A, E and F. They are excellent for moisturizing and protecting your lips. It has cancer-fighting abilities and helps reduce inflammation. It is a natural UV protectant and boosts collagen in the skin. But since this is essentially made of nuts, you may want to ask a doctor before using it if you have a nut allergy. Beeswax retains water and hence, keeps the skin hydrated, making the skin look young and rejuvenated. It provides mild pain relief, is antimicrobial and is naturally anti-inflammatory. It also creates a protective sheen on your lips but also allows them to “breathe”, as opposed to petroleum products that don’t allow the skin to breathe. Products using organic beeswax will have a natural, earthy honey smell and taste and a big plus is that it has anti-aging properties. Sun protection factor or SPF determines how well a sunscreen will protect your skin from radiations that cause sunburn or skin cancer (in some cases) and damage your skin. Your lips naturally need protection from the sun because they are the most sensitive area when it comes to sunburns. Hence, it is important that you choose a lip balm with SPF to keep your lips looking naturally healthy. It is entirely up to you if you want your lip balms to be flavored. And there are literally hundreds to choose from — they could range from some of the most commonly used flavors such as strawberry, watermelon, banana or any other fruits that you may think of, to wacky flavors like bacon, pickle or even French fries! But be wary before picking any of these, and know if you are allergic to flavoring; it may cause dryness to your lips. Clear, Shimmer, Tinted or Matte? ​No one said you can’t mix up lip protection with glamour! A line shine and color can go a long way if your lips are smooth and shiny. What better way then, to use a lip balm that has a shiny finish? Or if you are looking for a more sophisticated look but don’t want to use a lipstick, a tinted one that doubles up as an understated lipstick? Alternatively, if you want to keep it really subtle, matte should be your choice. Now that you know what to look for in a lip balm, we will move on to review what we think are the five best products currently available in the market. Our criteria to pick these was simple; some of them provide long-lasting protection, some of them because of their ingredients, the value for money they provide and others for covering all the bases. Never any petroleum, artificial colors, or sweeteners. A lot of products in the market claim to be unscented, but actually either have a chemical-like scent or they smell mildly of disinfectant. Badger’s Unscented Classic Lip Balm comes as advertised — they are actually devoid of any scent and is one of the few products out there to not have vitamin C or aloe vera. It contains rosemary extract, extra virgin olive oil and of course, beeswax. Has a smooth, silky texture. Contains absolutely no scent or taste. Very competitive pricing compared with other products. Has a ‘barely there’ feel. Lasts for up to 4 hours. Some customers complain that the 4-hour period is not long-lasting enough. Burt’s Bees lip balm contains no paraben and as mentioned, is made up of 100% natural components. It is infused with vitamin E that anti-oxidizes and moisturizes. It has just a hint of mint that tantalizes and soothes the lips at the same time. As the name suggests, it contains beeswax that conditions your lips naturally and shields them naturally. It is paraben-free and 100% natural. Comes in exciting flavors such as wild cherry, honey, pomegranate, vanilla and even mango! Very convenient to carry: you can put it in your purse or slip in your pocket. With this brand, you can be sure of the consistent quality. Revives the natural pinkness of your lips. The consistency can be too thick or waxy for some people. Comparable to other lip balms like Lip Smacker, EOS, Chapstick, Burts Bees, Revlon. / *wear it alone or under lipstick or lip gloss for an extra smooth kiss. 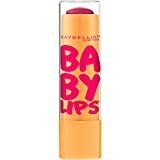 Maybelline New York Baby Lips is a lip balm that doubles up as a lipstick. That’s right! But the bright colors and glossy packaging could be deceiving, this product is actually very good at what it advertises. What’s more is that you can wear it under or over lipstick. It has shea butter and candelilla which are both great for repairing cracked lips and moisturizing. Moisturizes lips for a whole 8 hours. Is available in 6 shades. Visible results in about a week. Great for dry, cold days. Fills the dual role of both a lipstick and a lip balm. Clinically proven to make and look lips less dry. Feels very light on the lips. Does not offer UVA protection. 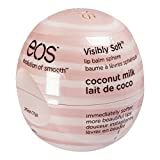 eos Organic Lip Balm Sphere - Strawberry Sorbet | Certified Organic & 100% Natural | 0.25 oz. EOS (Evolution of Smooth) organic smooth sphere lip balm offers a smooth glide on your lips when you apply it, and offers complete UAV/UVB protection and keeps your lips hydrated. It is infused with jojoba oil, shea butter and vitamin E to keep your lips noticeably smooth. These balms come in many flavors and are distinguishable because of their very distinctive egg-shaped packaging. Unique packaging that puts them apart from other products in the market. All products are gluten-free, hypoallergenic. Also, it is not tested on animals. Products are made of organic ingredients and so, are safe. Available in lip-smacking honeysuckle honeydew, pink grapefruit, vanilla mint and many other flavors. Contains natural conditioning oils which ensures your lips feel enriched and rejuvenated at all times. Its light, organic and not too shiny. Feels just right on your lips! The price is higher when compared with other products in its category. Like it suggests in the name, Palmer’s cocoa butter lip balm contains delicious cocoa butter and SPF 15 that provide total sun protection. At the same time, it smells heavenly and is colorless. Furthermore, it keeps your lips from drying and keeps them from dehydration. Because of its smooth texture, it can also be applied to the back of your hands if they feel dry. Comes in simple packaging and has a twist-up mechanism. Comes in three variants, including cherry. Doesn’t add any color to the lips. Pleasing, invigorating cocoa butter aroma. Quickly absorbed on the skin, making them supple and hydrated. Lasts for quite a long period of time (up to 6 hours). Travel-friendly packing; can slip into your pocket. Excellent for people with dry skin. Contains mineral oils which may put some customers off. The manufacturers at Sky Organics lip balm claim that all their ingredients are cold pressed, which means they retain their vitamins and nutrients. It also offers a wide variety of flavors that include luscious Tahitian vanilla, cherry bomb, eucalyptus mint and many more. If you prefer all-natural products, you will love this lip balm! Certified by the United States Department of Agriculture. Flavors so delicious, you will want to eat them! Packed with natural, organic ingredients such as sunflower oil, beeswax, vitamin E, coconut oil, rosemary extract and calendula. Is non-toxic and contains no petroleum derivatives. 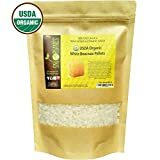 Helps encourage healing of damaged lips. Is appropriate for all ages and skin types. Does not last a long time, may need to apply more than once in a day. Proven to relieve dryness and soothe chapped, cracked lips. Seals in moisture and helps prevent dryness. Formulated with nourishing vitamins, Shea Butter and soothing Chamomile essence for soft lips. Specially formulated for sensitive lips. 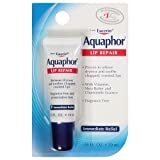 Yet another one of the best lip balms available is the Aquaphor Lip Repair. The moisturizing formula, specifically designed for sensitive lips, provides immediate relief from severe dryness. Vaseline, a well-known name in the world of lip balms, offers an excellent formula to consider. The Lip Therapy Advanced Healing balm offers long lasting, effective moisture and protection from the elements. NEW! Get noticed with visibly softer lips. eos Visibly Soft Lip Balm, enriched with natural conditioning oils, moisturizing shea butter and antioxidant vitamins C & E, nourishes for immediately softer, more beautiful lips. Featuring 99% natural ingredients, the Coconut Milk Lip Balm by EOS is a safe, effective option for creating smooth, healthy lips. The formula, enriched with natural conditioning oils, delivers high levels of hydration and moisture. Featuring hemp seed oil, shea butter, and avocado oil, Hempz Ultra Moisturizing Herbal Lip Balm is a wonderful option for pampering lips. Hempz lip balm possesses an impressive ability to increase moisture levels in the lips due to its variety of natural extracts and special moisturizers. Dr. Dan's SunBlock SPF30 protects your lips and helps to keep them soft all at the same time. It contains all hypoallergenic ingredients that limit the chemical irritation produced by other sun blocking lip balms. Protect your lips from the harmful rays of the sun and the side effects of sun burn and cancer. Natural yellow wax and chemical-free base with the antioxidant Vitamin E combine to create the perfect moisturizing combination. It took years to perfect this formula and now that it is done, it will sure protect your lips from the harshest rays. Dr. Dan’s patented formula is proven to heal chapped, sore lips. As a bonus, the powerful featured ingredient, hydrocortisone, is capable of reducing inflammation caused by cold sores. 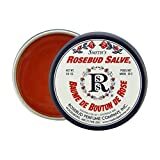 A cult favorite, even among celebrities, Smith’s Rosebud Salve has long been known as a popular lip balm choice. Boasting a secret, patented blend of essential oils in a moisturizing base, this balm will help keep your lips supple and rosy. Lanolin-Based Helps Keep Skin Smooth and Soft. Outstanding for cracked hands, cracked heals, elbows and dry knuckles. Bag Balm works hard all year round, and works well. Lanolin-enriched Bag Balm is a protective ointment that helps keep skin moisturized and soft. Its simple, tried and true formula is easy to apply and is designed to remain on the affected area. Compare the tried and tested results of Vermont's Original Bag Balm products to similar products from brands like Musher's Secret, Burts Bees, I Heart Pet Head, BodhiDog, Ruff Relief, Vets Preferred, Paw Soother, Espree, BotaniVet, Max and Neo, or Paw Magic. Helps soothe cuts, scratches, skin irritations, and abrasions. First on our list is Bag Balm, a versatile, intense moisturizer formulated to withstand harsh conditions. Developed in Vermont over a century ago, Bag Balm has long been a staple for dry, chafed skin, including lips. While buying a lip balm, you should look for the following — the type of ingredients it has, whether it offers sun protection, does it prevent moisture loss, does it let your skin breathe, does it moisturize it and does it rehydrate your skin. If you have sensitive skin, avoid balms that offer artificial flavoring as your skin may react unfavorably and may get irritable. Another thing to consider is if your lip balm has an even consistency and will provide protection to your lips for a longer period. At the same time, be wary of the compulsive use of a lip balm even when you don’t need to. Lip balm addiction is common and is purely psychological and has nothing to do with ingredients. It is normally recommended that you put lip balm before going to bed so it moisturizes and smooths your lips for a longer period, reducing the need to apply it many times during the day. In conclusion, the right kind of lip balm would provide adequate protection for your lips, has the kind of organic flavor that you desire (one that you do not mind consuming), stays on for a long time and hydrates your skin. Don’t settle for less! Knowing how to protect your lips is crucial in order to keep them smooth, plump, and radiant. Use the list above for guidance when choosing the right lip balm and let us know which one(s) you decide to try. Do you currently use any of the lip balms on the list? What other lip balms would you recommend?